- For single speed, fixies, BMX and hub gears. Very simple, easy to fit and powerful chain tensioner. A must have when you convert a vertical drop bike into single speed. Yes this will be suitable with a 9 speed 3/32 chain. Can this tensioner be run in push up mode? With about 5 minutes work to swap the components around from one side to the other, yes this will push up. Hi, I would like to know if the chain tensioner fits into the derailleur hanger of the frame or the drop outs? I have a trekking bike, converted to Alfine humb gear and would like to use the derailleur hanger. Also, the SHIMANO Alfine Chain tensioner CT-S500 with 2 pulleys did not fit as even with the spacers, adding up to 5 mm, the tensioner's pulleys did not align to the sprockets. The pulleys were too much towards the wheel. The distance centre of dropout to centre of sprocket is 25 mm. I assume that distance could be achieved with your chain tensioner? This threads directly into the derailleur hanger on the frame. 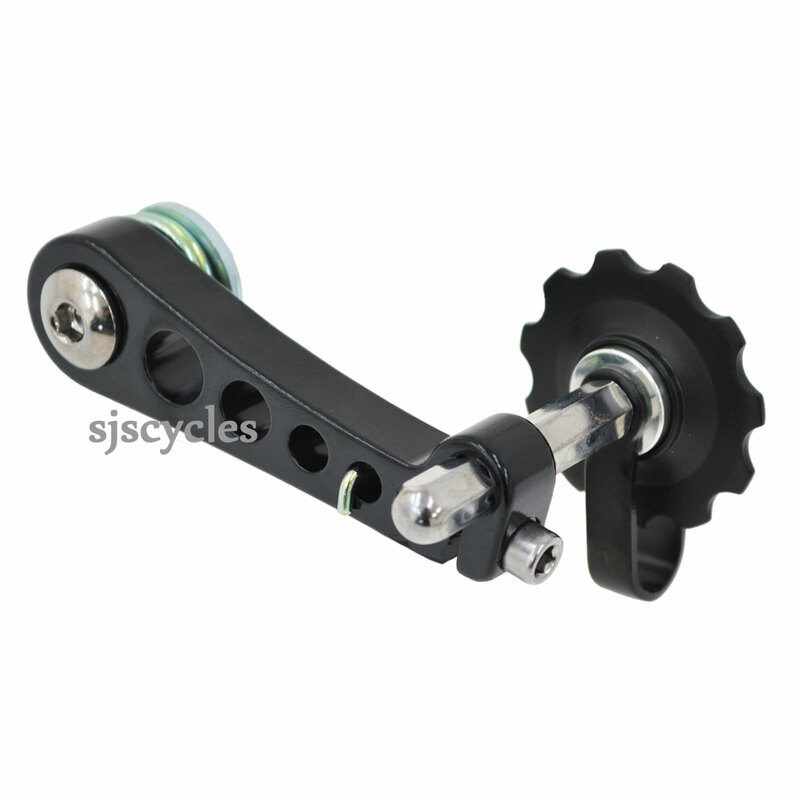 This tensioner is highly adjustable so you should be able to achieve the desired chainline with it.